Elissa Malcohn’s award-winning fiction, nonfiction, and poetry have appeared in dozens of publications from the 1970s on. If you haven’t stopped by Malcohn’s World you should if for no other reason than to read her great collection of rejection letters. I was in grade school. When I graduated, PS 99 in Brooklyn ordered two English medals, renamed one its first Creative Writing medal, and gave it to me. I was already writing my first speculative fiction stories. I was also one of two people in my graduating class to win a Read Magazine Creative Writing Award. The literature of mythology (especially the retelling of Greek myths by Bernard Evslin, Dorothy Evslin, and Ned Hoopes) drew me in when I was a child. So did television programs like Star Trek and movies animated by Ray Harryhausen. I first read SF when I was nine, but was galvanized by anthologies about three years later and was weaned on the New Wave subgenre. (Peter Graham’s adage, “The golden age of science fiction is twelve,” literally applies to me.) For me, speculative fiction is away to plumb the human psyche and soul through the stealth of metaphor. That one should never submit to a non-paying market. I take everything on a case-by-case basis. 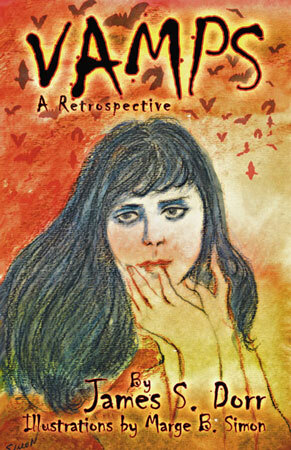 In the June 2010 issue of Niteblade, Rhonda chose to publish your story, “Icarus Redux“. Is there a story behind how it came about? I initially wrote “Icarus Redux” in response to a submissions call from a horror anthology that never got off the ground. The call had specified flash fiction, so I cast about for a story arc that would fit. Part of my inspiration may have come from a severed cardinal’s head that had turned up in my yard not long before. I suspect a great horned owl was the culprit there. 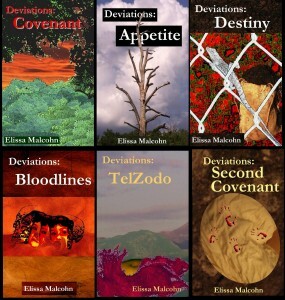 I recently released Second Covenant, the sixth and final installment of my Deviations series (available for free download through my website, http://home.earthlink.net/~deviations). I’m working on a “behind the scenes” supplement to the saga, along with some shorter pieces. My personal mantra is, “Nothing is wasted.” I apply that to everything, from the crap I write while trying to get a scene right, to life in general. 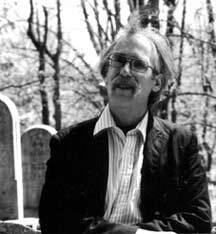 James S. Dorr’s poetry has appeared in Niteblade several times. Here’s an interview which will let you get to know him a bit better. It’s hard to say. My original interest even by the time I had entered college was in visual arts. I was a cartoonist/illustrator on the humor magazine (eventually becoming art editor), I designed posters, I even did set design for the campus “little theatre.” However I also did some utility writing on the humor magazine, as well as being exposed to writing as an illlustrator on the literary magazine staff, and then when the Science Fiction club started a fanzine (think amateur ezine, but done with mimeograph on paper) I both illustrated and wrote generally humorous sf/fantasy parodies. By grad school I’d turned more to the writing end, doing a weekly science/humor column, for instance, which led to editorial work (albeit still doing occasional article illustrations), and then to a paying gig as a technical writer (which also involved editorial work), so I suppose it happened somewhere in there. Eventually I left technical writing, freelancing real estate and business/consumer articles, and then got a more mundane flunkey job which freed me to go back to “creative” writing including poetry — which is probably more or less where I am now. So I’d have to say it was more a process, or a “coming to realize over time” than an actual sudden revelation. Imagination, I think. I like to think of impossible things before breakfast — except that my imagination isn’t that good. Thinking up story or poetry ideas is a struggle for me, but as a kid I loved reading science fiction, then later fantasy via, at first, The Lord of the Rings, and through it all horror via the Modern Library Giant edition of The Complete Tales and Poems of Edgar Allan Poe (with tiny type that grows harder to read, but it’s still on my bookshelf!) and Ray Bradbury’s The October Country, etc., drawing on others’ imaginations to feed my own. Then, as I was moving away from freelance nonfiction work, I also made it a point to experiment with fiction writing myself, to learn the differences in the mechanics of writing to entertain rather than teach, for instance, so while I still have trouble with ideas, I now go to nonfiction — history, biography, travel, science — to find things I can use to put into stories. “Always write at least a little every day.” Or, “write at least a set amount every day,” or “an hour every day,” or . . . you get the idea. But that’s the sort of thing I did for work, and creativity, I think, has to be a form of play. Even working, my best moments came when I had the flexibility to make my own schedules — I might have to write to a specific deadline, but when I got started was still my decision. So, while I can see the sense of the advice, especially for someone starting into writing cold — think of it then like practicing a musical instrument (and, yes, I play music too, as tenor in a Renaissance recorder consort that I also lead) — I myself am too undisciplined to follow it seriously. Rather, I like things to be open ended, preferring not to start a new story, for instance, unless I have at least a four-hour block free ahead of me. While on other days I might not write at all, but there are other things that need to be done too like submitting work, or contacting editors, or proofing galleys, which might be less fun but may also free up my unconscious mind to be ready when, maybe the next day, meybe next Saturday, I do find time to sit down and start writing. In the March 2010 issue of Niteblade, Rhonda chose to publish your poem, “Second Chance“. Is there a story behind how it came about? “Second Chance” was itself a second chance in its way. I had sent Rhonda a group of poems including two haiku-styled pieces about killer snowmen. But then I discovered one of the two had already been sent to another market, so I re-sent the others with an apology and explanation, offering “Second Chance” as a substitute for the poem I was withdrawing. So these things happen. But then a week later I got an email with an apology of sorts from Rhonda saying she wanted to use both “Second Chance” and the second snowman poem, “Winter Wonder (2),” but wanted to hold “Winter Wonder (2)” until the December 2010 issue. And so both were published, though at different times. But there’s a second story too. “Second Chance” was inspired by a movie with Bela Lugosi, The Return of the Vampire, in which a “staked” vampire is unearthed in a World War II London cemetery after a bomb hit during the Blitz. A clean up crew, assuming the stake is a shard from the bomb, pull it out and rebury the now “undesecrated” body, and so the fun begins. I’d like to add that “Second Chance” has been reprinted in Vamps (A Retrospective), my just-published book of vampiric poetry (of which more in a moment), but it happens, almost by accident, that it’s not — simply a case of there being too many shorter poems to choose from, so some had to be left out. However another poem from Niteblade, “High-Flying” from September 2007, does appear there. 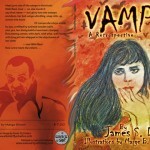 The immediate news is I’ve just published a book of poetry on vampires, Vamps (A Retrospective). 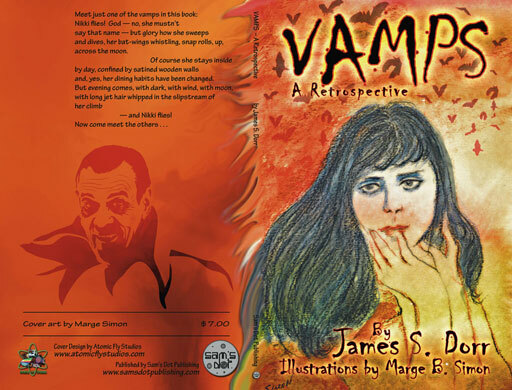 Illustrated by artist and poet and fellow Niteblade contributor Marge Simon, it’s just come out as an August release in trade paperback from Sam’s Dot Publishing, and for only about the cost of a small pizza — well, depending on toppings and local variations — which makes it a bargain even if you just get it for the pictures. “Pimpage” aside, it has seventy-five poems of varying lengths, about a third of which are unpublished, looking at the vampire myth through various “characters” (Annchuck, Melissa, the gods of Ancient Greece, jazz fans, baseball nuts, Nikki, “Medusa,” victims and lovers, a vamp from the future. . . ) and from a variety of different angles. 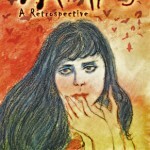 Also just out is Vanitas, an electronic chapbook from Untreed Reads Publishing of a story combining mystery, gothic romance, and steam that originally appeared in Alfred Hitchcock’s Mystery Magazine. 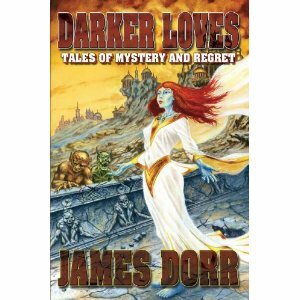 Looking ahead, I’ve been working on a novel based on a series of stories set in the “Tombs,” a vast necropolis and its environs on a far-future dying Earth, about a dozen of which have already been published in various places. This would be structured somewhat like Bradbury’s The Martian Chronicles or Christopher Barzak’s The Love We Share Without Knowing in that individual stories could still stand alone, but combined add up to a larger picture. Also, partly as a response to a weak economy, I’ve been pushing to republish earlier stories in various anthologies which, if not the highest paying, still add up — as well as getting work of mine back into circulation — along with writing new stories and poems. Along with Vamps (A Retrospective), I have two collections of fiction and poetry, Strange Mistresses: Tales of Wonder and Romance and Darker Loves: Tales of Mystery and Regret, available from Dark Regions Press; a long out-of-print poetry chapbook Towers of Darkness (the origin of several of the characters in Vamps) originally published by Nocturnal Publications; and several hundred individual publications from Aboriginal Science Fiction and Alfred Hitchcock’s to Xenophilia and The Yellow Bat Review. For further news about me and my doings including new sales and reprints — and links to publishers for my books — along with occasional sample stories and poems, movies I’ve watched, bibliographic information, and maybe a note or two on my cat Wednesday, I invite readers to check out my site, and have a look around. Comments are always welcome.